The Folkish view of Heathenry is the notion that one has to have a certain amount of Germanic blood flowing through their veins in order to have the right (for lack of a better word) to be a Heathen. I have read that certain Folkish groups insist one to have at least upwards of 51% or more of a Germanic bloodline as a pre-existing clause to acceptance. How that is determined I have no idea. I have seen an Online interview of Steve McNallan of the Asatru Folk Assembly where he is questioned on this very subject and he makes a good point; in that, Heathenry/Asatru is indeed an ancestral way. Not only do we hold our own ancestors in high esteem but we also see our gods as our ancestors. It would prove difficult to participate in an ancestral belief system without the ancestral connection. Yet I think that difficulty is not insurmountable . The Germanic bloodline is fairly wide and varied in itself. In its origin, it ranged through all of Scandinavia, to Iceland, the British Idles and much of Northern Europe. My question is: How much ancestral blood does it take to cry out for satisfaction? In my opinion it could be a minute parcel of blood, perhaps a single drop that screams: HEY, PAY ATTENTION TO ME! I NEED SATISFACTION HERE! All that being said, if I have someone approach me for membership, part of my inquiry would be to make sure they have fully investigated their own cultural expression first, whatever that may be. Once anyone can assure me they have done that but still have a draw to Heathenry, then and only then would I consider them as possible probationers and serious contacts for Haus Rheinwood. When I am convinced of the person's sincerity I will consider him/her for membership no matter the bloodline. Centering on one's bloodline just doesn't make sense any more. Every potential blood-oath sworn member for Haus Rheinwood must first subject themselves to a one-year (give or take) probationary period and oaths are taken every year at Yule. Once someone starts their probationary period membership it is not a guarantee. Within that time either the probationer will make up his/her mind if he/she truly wants to be a member, or within that time Haus Rheinwood will know if we want him/her as a Kindred member. It's a two-way street. substantiate him/herself. As it says in James Coulter's book; Germanic Heathenry (p.30), "Ours (the Irminenschaft) is a system of action and deed above all else: believe what you will, it is your actions that make and prove your worth." Additionally, Allsherjargoði Sveinbjörn Beinteinsson of Iceland http://en.wikipedia.org/wiki/Sveinbj%C3%B6rn_Beinteinsson , arguably the Father of modern Asatru is believed to have said, "Anyone can pray to the gods, in whatever manner he (or she) likes. 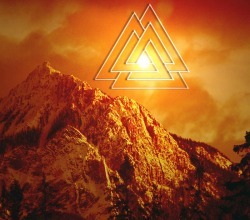 Odin stands for Wisdom, the Imagination, and great Knowledge." So, with Irminic teaching coupled what the Allsherjargoði said, the doors to Heathenry have been opened wide as far as I'm concerned. The Germanic bloodline is a strong, proud bloodline but it is not in any way indicative of superiority. In today’s society it’s a hard task to say who is how much of what. One’s own ancestry is of vital importance but the reality is we are a mixed bag of people intertwined throughout the word. It’s a good thing to be racially or culturally proud. It’s a bad thing to consider race or culture a means to indicate superiority.